Being big into genealogy and family history, I started writing a historical fiction a few years back. People have been asking me how it’s coming, and to tell the truth, I had put it on a shelf and forgotten about it. After people asking about its progress, I thought it was time to get it out and do some more story telling. 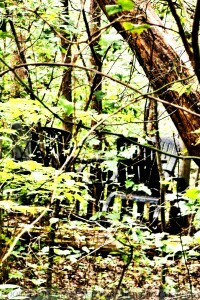 Fiction requires imagination, and being in imagination mode, so when I happened to get a glimpse of a long forgotten table and chair set in the woods by my house, I got to wondering. Who had set it up? What had happened there? Why had it been abandoned? Do you see it there, hidden by the overgrowth of time? It’s sad to think it had been abandoned and happy to imagine the wonderful family picnics it had stood for. Of course I am making an assumption. The scene of Aslan, being sacrificed on the stone table in “The Lion, the Witch, and the Wardrobe” flashed through my mind, and I realized that this may not have been a place of happy memories, but perhaps a location that bad memories, best forgotten, had been forged. Being the positive person I try to be, I quickly let that thought go out of my mind and concentrated on believing that happy family memories were made at this table. And yet, here it sits, abandoned to the woods of time. I hoped that the original owners still cherished the happy memories of togetherness with friends and family. It reminded me of fun times with my family. And it reminded me that time is precious, good memories are important, and we must remember the stories of our lives and pass them on to our children, and their children, and continue to pass them down the generations. For how can we understand the values of our family if we know not the reasons behind them? Do you know your family history? Maybe something terrible happened in your family’s past! You know what? You can make new memories, and tell a better story to the next generations. If history is destined to repeat itself, change it now and let it repeat in a better way! We’re coming up on a long weekend. Go out and make some fun family memories, maybe have a picnic in the woods – grin. « Are you too busy?